Adam Lord hands over the Lancaster Guardian Sportswriters' Player of the Year award to Jordan Connerton. Lancaster City celebrated their title triumph at their end of season awards evening on Saturday night. Goal machine Jordan Connerton was one of the big winners on the night, the striker picking up a hat-trick of gongs at the Vale of Lune Rugby Club. Adam Lord hands over the Joe Stephenson Memorial Trophy for top marks in the Lancaster Guardian to Ricky Mercer. 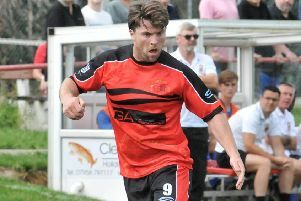 The 35-goal front man was named the Supporters’ Player of the Year, Lancaster Guardian Sportswriters’ Player of the Year and picked up an award as the club’s leading marksman as they won the Evo-Stik First Division North title. Having been honoured for a remarkable season in front of goal, Connerton then flew to Australia on Monday having decided to return to Melbourne to pursue other career opportunities. There were also two awards for captain Ricky Mercer who picked up the Joe Stephenson Memorial Trophy, for the highest marks in the Lancaster Guardian across the season, as well as being named Players’ Player of the Year, an honour voted for by his team mates. Simon Wills’ tenacious displays in midfield saw him be picked out as chairman Stuart Houghton’s Player of the Year as well as be named the Directors’ Player of the Year. Ryan Winder won the goal of the season prize for his stunning volley in the key 3-2 victory over title rivals Farsley Celtic at Giant Axe back in February. As well as first team success, the Dolly Blues’ Under 21s were honoured for a successful first season that has seen them lift the Lancashire FA County Cup at Leyland. Aaron Hoyle was named Player of the Year with Will Fraser-Gray picking up an award as the top goal scorer. Club secretary Graham Dockerty was named Clubman of the Year for his tireless work with both the first team and the Under 21s. Richard Galloway was the Gold Bond Collector of the Year.